Players are able to transverse through full 3D environments, utilizing various ways of movement such as walking on walls, water, or dashing around the streets of a village. Gameplay consists of three main systems: Weapons that take advantage of a quickfire system, Jutsus that make use of combo based inputs, and Taijutsu abilities that can transfer into aerial combos! 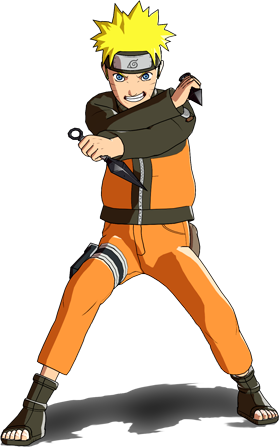 Players are able to throw a single Kunai, or a spread of Shurikens to damage opponents and disrupt their Jutsu's. Exploding tags can be stuck on surfaces and players, as well as being able to throw one attached to a Kunai. The Jutsu system allows players to execute powerful Jutsus or techniques. By holding shift, players will then input combo strings of 2-4 using WASD on the keyboard. Correctly inputting a combo will then execute its respective attack. The Taijutsu or melee system is very simple to learn but takes a lot of practice to become the best. The primary function allows players to attack consecutively for five hits before sending your opponent sliding back. The secondary function allows players to knock their opponents into the air, where various other methods of attack can then be executed, such as throwing a weapon, performing a Jutsu, or jumping in the air to continue an aerial combo. Naruto: Naiteki Kensei has been officially released to the public! The first release consists of Team 7, which includes Hatake Kakashi, Haruno Sakura, Uchiha Sasuke and Uzumaki Naruto. Each character has three specific Jutsus at their disposal. Naruto: Naiteki Kensei R1 is a free online multiplayer game, created as a fan-project for many others to enjoy. It is a total-conversion of Half-Life 1, meaning the game was created based on the Half-Life engine. In order to play, an installed steam client and an installed copy of Half-Life through steam is required. View this Tutorial for a guided walk through of how to Install Steam, Half-life, and NNK. For more information, please visit www.Naiteki-Kensei.com. Sign up on our forums to talk to fellow fans and suggest your own new ideas for future releases! Dattebayo! Hey guys, thanks for following up. - What my position was in NNK and what I was responsible for, as well as showing you less technical and more practical in that regard. - Fun Q&A I'll also be giving the stable version of the game to my friends so we can actually demo things properly, live, without silly bots being... silly. Here's a fun video I made. Messing around with some of Naruto's facial expressions! This time, NNK R2's Main Menu design and some more gameplay! Watch the very first proper gameplay footage of what was supposed to be NNK R2. Random Update #... Who's counting? Welcome to Late Random (and rather big...) Update #8?... Sorry for the downtime here (specifically), guys. I finally got my old account back! Naruto: Naiteki Kensei's Original Sound track by TimN. We showcase some of the features you can expect to see in NNK R1! Enjoy the video in full 720p. Tim N.'s remix of Naruto's classic Orochimaru theme! An in-depth look at some strategies you can utilize with NNK's weapon system! Friday Update #73 - Weapons: In-depth video in HQ for you to enjoy! There is no news since years. It's more like spam. Delete them pls. Can I have problems with Steam VAC if I use this mod in my game? How do you launch the game? I'm trying not to do it through Steam, but I can't seem to find an application file. Can somebody please help? sheesh...what are people thinking, making a game takes longer than you think you know. Some games done quick cuz they literally have a whole company with more than 30 people working on a game, their job spreads out and done much quicker. Remember this is a fan game, not even more than 10 people working on it,even if it takes about 3 or more years it still won't be as polished. Don't rush them they are trying their best to release the game as soon as possible..You people only job is to wait until this game comes out. Hello to all new subscribers! Welcome to Naiteki-Kensei's twitter! RT us and let your friends know we're here for exclusive updates and insider info!